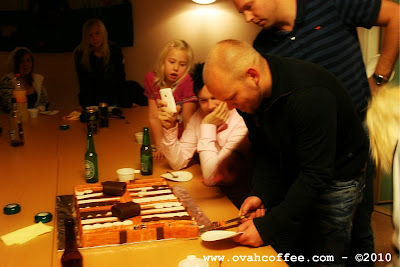 October 23, 2010 ~~~ Micke and Tommy, my boyfriend's brothers, celebrated their birthdays on the same day last Saturday. Louise [Micke's wife] messaged me a couple of weeks before the big day about the idea on the cake's theme. She suggested a backgammon cake which made a lot of sense since both of the celebrants were backgammon lovers. I was so excited to produce my newest creation. I started planning at once ~~~ the size, the color and the details I would be needing to put together the surprise cake. 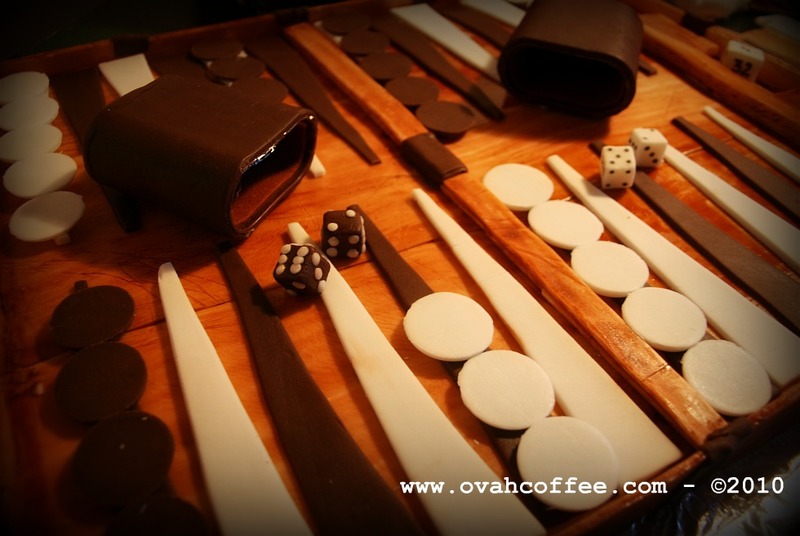 I copied my boyfriend's backgammon set. It was of the same size -huge! This cake was too detailed and I did love the challenge! I covered the cake with white fondant that I painted with brown edible coloring gel to get a newly varnished wood effect. The brown bar-points, brown checkers, brown dice and dice holders were made of modelling chocolate. The white bar-points, white checkers, white pieces of dice and the doubling cube were made of white fondant. On the photo below: The celebrants! Micke and Tommy got so surprised. 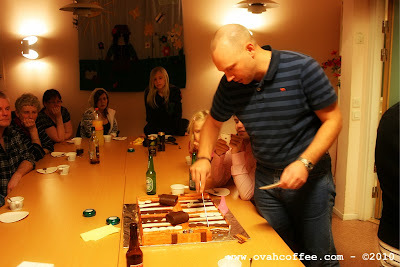 Everybody loved the cake. It took us awhile before the cake was finally sliced into pieces as noone wanted to destroy the pretty cake. No choice! The cake had to be eaten! Slice it! 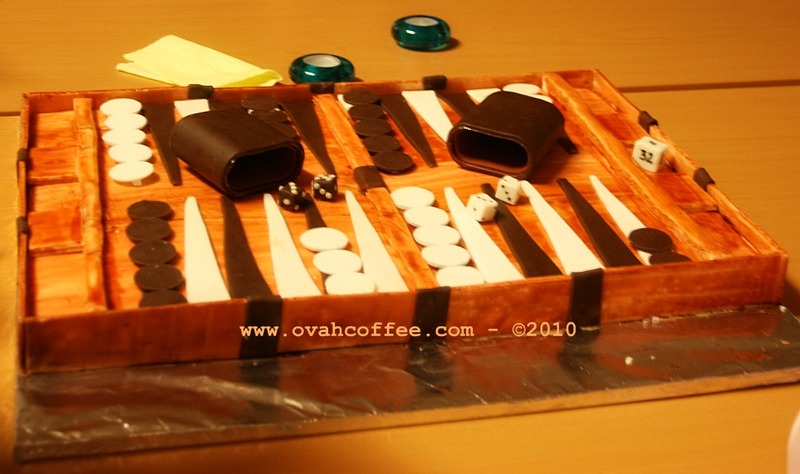 I had fun creating this backgammon cake and the best part was, I was able to make the birthday boys go "Wow!" on their special day. Mission accomplished! Off to my next mission! Oh my my ... talk about time consuming! But you knew that going in, so it was worth it. Great job and something the celebrants will never forget. have a good weekend! Truly time consuming. The good thing is that I have had fun creating the cake. I love making personalized cakes. I get the chance to put my creativity into action. And when I've seen the celebrants' really happy faces, it is sure worth it! You, too! Have a nice weekend, Frank! Hello Mar'! Thank! Yup, everything from scratch! Cool, huh? I will be going to a pastry arts school soon. I can't wait! 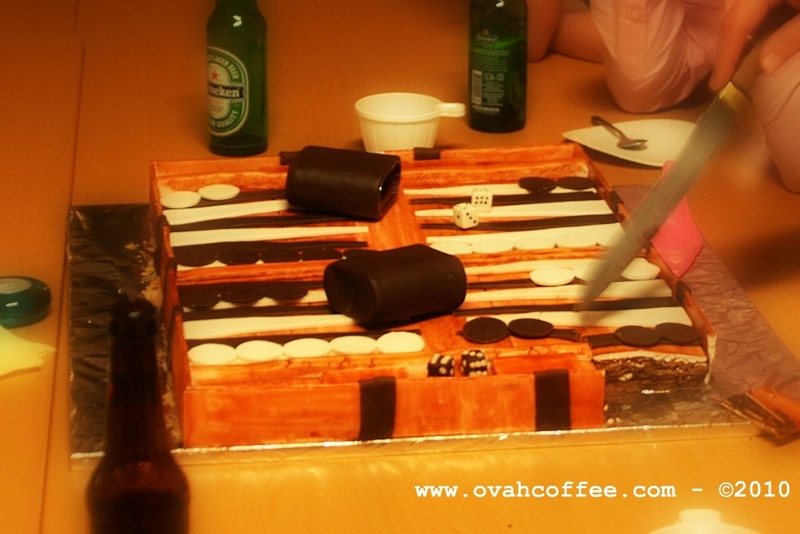 waaaa I cant believe it's a cake!! you sure Maxi? as in? hehehe, you're so creative as in!! Wow! Ang sarap naman niyan...Uy namiss kita...kmusta na? ang galing galing!!! bilib ako sobra! you are one good and creative baker! :) at yummy siguro yan!!! gusto ko yan!! !